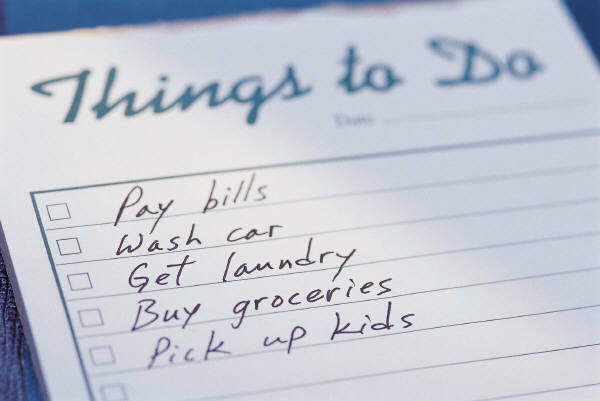 My husband loves honey-do lists–the longer the list, the more satisfied he feels when each item has a bold hash mark through it. Mow the lawn. Done. Change the light fixtures. All set. Pay the bills. Taken care of. Despite Dave’s affinity for these lists, I have never given him one. Even more than that, I’m careful not to mention things that need to be taken care of around the house because–like Santa’s list– they’ll be added to the queue. I know some of you are wondering if I’ve lost touch with reality. You may be thinking, “What I wouldn’t do just to get my husband to take out the trash or wash the dishes. She’s nuts!” The issue for me is not whether or not chores get done or if I can rely on Dave’s help at home. Instead, I’m concerned about spending time together. We’ve actually agreed to put all work aside by noon on weekends–just to guarantee time is spent doing what is necessary at home AND necessary for our relationship. Love–in my language–is spelled T-I-M-E. Others of you may feel most loved when your husband brings you flowers, writes a love note, snuggles–or vacuums the family room. What is it that make you feel special? Starry-eyed? Affectionate? While you’re thinking about it, pause to consider what feeds your husband’s love for you. Does he beam when you pack his lunch? Would he prefer a back rub? Or, does he just need to hear you say, “I’d marry you all over again.”? Early in our marriage, Dave and I read a great book by Gary Chapman called The Five Love Languages. If you want to know your spouse better–or even need to share with him what would help you feel loved and appreciated–then you might want to read it. Even better, read it together. Who knows, maybe your chores will get done after all! words of affirmation? Tuck love notes in his dresser drawer, lunchbox, and CD case. time together? Plan a date for him–action movies, pizza, and beer. acts of service? Ask him to make a honey-do list for you. physical touch? Cozy up during a football game or hold his hand–in public. gifts? Stop by the office with coffee or give him a book he’s always wanted to read. I so agree! I would rather have my husband’s time than anything else! Hi, Caroline. What’s your secondary love language? Are your husband’s similar?